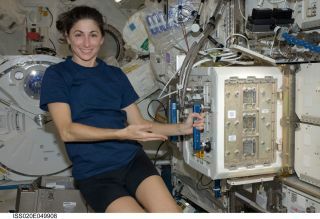 NASA astronaut Nicole Stott, Expedition 20/21 flight engineer, is pictured near the Mice Drawer System (MDS) in the Kibo laboratory of the International Space Station. Results from the MDS program have shown premature aging in the mouse skin after three months in microgravity. While beauty creams on Earth often claim to have "antigravity" effects on the skin, a weightless environment may actually cause premature aging of the epidermis, according to a new study looking at mice. Three mice that lived on the International Space Station for 91 days — the longest period that rodents have ever spent in space — suffered a 15 percent thinning in the dermis, the subsurface layer of the skin. This is the first study of the effects of a weightless environment on animal skin, the authors of the new study say. It's well-known that astronauts in space report having dry skin that is more susceptible to small cuts. That's on top of the other recorded health effects caused by living in microgravity, including bone and muscle loss, changes in vision and stiff arteries. While many of these ailments can be repaired over time once the astronauts return to Earth, they raise concerns about the health effects of long-term space missions. Space experiments that involve animals give researchers the opportunity to study the health effects of microgravity in ways that often cannot be done with human astronauts (studies on humans are usually noninvasive). The Mice Drawer System (MDS) Tissue Sharing program provided 20 research teams with organs and tissues from three mice that lived aboard the orbiting station for 91 days. A group of researchers led by Betty Nusgens, an honorary professor of biology at the University of Liège in Belgium, took samples of the mice skin, and found a 15 percent reduction in the thickness of the dermis. Nusgens said this rate of thinning is faster than what is normally seen in humans on Earth (even when accounting for the shorter life spans of mice). Nusgens said healthy skin in young mice (and people) experiences some destruction of old collagen, which is then replaced with new collagen. Skin remains healthy and normal as long as the synthesis of new collagen is equal to or higher than the destruction of old collagen. In orbit, the mouse skin showed a rise in both the production and destruction of collagen in the dermis, compared with control mice on Earth, but with a larger increase in collagen degradation. "The final balance [of collagen] is negative, meaning that the degradation is probably more active than the synthesis," Nusgens told Space.com. "So this is a progressive loss of collagen in the skin, like in aging people." Nusgens said scientists don't know why the skins of mice undergo accelerated degradation in microgravity. "We know that the cells that make collagen in the skin — called fibroblasts — these cells are responsive to mechanical stress and to stress relaxation, so [the] cell can respond to the loss of gravity in space," Nusgens said. "Knowing that, we are going to send fibroblasts alone [to] the [International Space Station] next December." The Mice Drawer System before flight to the ISS. The researchers also found some changes in hair growth in the space mice. Hair goes through cycles, during which a given strand may be in various phases, including a growth phase or a resting phase. On Earth, Nusgens and her team found roughly 1 out of every 9 hairs on a control mouse's body is in the growth phase; but in the astro mice, all the hairs were in the growth phase. "Something is disturbed with the hair cycle in these mice," she said. "Hair growth depends on stem cells, so we feel that the program of the stem cell may be disturbed by space. But we have no experimental evidence of this; it's just hypothesis." Nusgens called the result "completely unexpected," and said there are no experiments she is aware of to test hair growth in astronauts. Nusgens notes that it's unlikely that an earth-bound study with such a small sample size (only three test mice) would be accepted for publication, but exceptions are made for experiments done in space because data is hard to come by. "We would like to have more animals, but this will never be repeated with such a long experiment, I think," Nusgens said. NASA is currently running a skin experiment on astronauts aboard the International Space Station called Skin-B, which will "improve our understanding of skin aging, which is slow on Earth but very much accelerated in space," according to NASA. The research was published in the new journal npj Microgravity. Follow Calla Cofield @callacofield. Follow us @Spacedotcom, Facebook and Google+. Original article on Spa ce.com.